Hoppin' John, the classic meal to serve on New Year's Day, is a soul dish that has African, Caribbean, and French roots. While eating black eyed peas for good luck in the new year is a tradition with roots from the American South, the custom actually goes all the way back to the Babylonians. Part of the tradition is that a shiny coin is buried among the black-eyed peas before serving. It is said that the person who finds the coin in their bowl is ensured good luck throughout the following year. Since Hoppin' John is traditionally from the American South, why not use lard to cook the ingredients in if you have some on hand? Lard is a healthy fat that is full of vitamin D if the pigs were on pasture. It's a good source of mono-unsaturated (47-50% of the fat) and saturated fats (38-43%). Lard has been consumed by people around the world for thousands of years (for example, Mexico and other Latin American countries, as well as China and Spain, and Okinawa). While it is often consumed as the first meal on New Year's Day, I regularly eat Hoppin' John for brunch or lunch. If you like, you can eat it for dinner too. 1. Place the black-eyed peas in a stock pot or Dutch oven. Cover with warm water, cover with lid, set in a warm place, and soak for 12-24 hours. 2. Drain and rinse the black-eyed peas in a colander. Set aside. 3. Fry bacon in a skillet. When cooked through, transfer bacon to a cutting board and chop. Reserve the bacon grease for later (you'll need it for the collard greens). 4. Heat butter or lard in stockpot. 5. Chop onion, celery, green pepper, and garlic. Add to stockpot and cook for 4 minutes. 6. Add the black-eyed peas, stock, bay leaf, bacon, and thyme. 7. Bring to a boil, reduce the heat and simmer on low heat for 45 minutes to a few hours. You can also do this in the crock pot all day on low heat. If the liquid evaporates, add more chicken stock. 8. Up to a couple of hours before you are ready to eat, cook the brown rice in a rice cooker according to instructions (or follow instructions for cooking brown rice in Sally Fallon's Nourishing Traditions). Keep warm until the black-eyed peas are ready..
9. Add sea salt, black pepper and cayenne to the black-eyed peas to taste. 10. Serve over rice, with collard greens on the side. Love it! Thanks for that info, I’m always excited to learn food history and lore tidbits like that. But I’d be sure there was a coin in everyone’s bowl ;). I never knew about this Hoppin’ John thing. I’m always learning something from you. Thanks for sharing the yummy recipe. Can’t wait to try it! Happy New Year! I wish you a spectacular 2011. God bless. Hi – thanks for all the recipes and thoughts you share :-). I have just eaten my first ever batch of chicken liver mousse inspired by one of your posts…I am not a fan of meat in general – or rather, I’m not a fan of consuming meat in conventional (huge!) amounts (and I’m lactose intolerant…) – but I believe that when I do eat meat it should be nutritious and delicious, and I love it that I can contribute to all of the animal slaughtered getting used! Just my two cents’ rambling :-) – and happy new year! I was just reading this same recipe (or very nearly) over on Michael Rhulman’s blog. I said I was going to try it with black beans, since my wife and I both dislike blackeyed peas. Someone said that variation is called Hoppin’ Juan. One change to your directions is that I always chop my bacon before cooking. It cooks easier, and that way I don’t have to handle hot, greasy back and a sharp knife at the same time. By the way, I saw this today about the latest round of hacked WordPress installations: https://jasoncosper.com/archives/wordpress-style-css-php-and-you/ You might want to check for it. Great recipe. 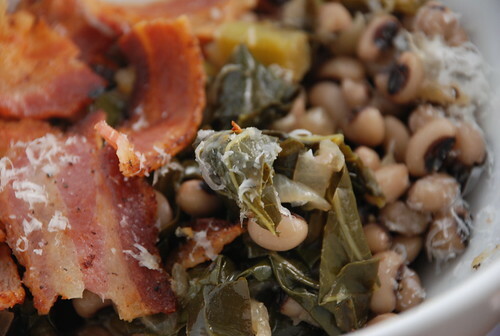 We eat black eyed peas and greens every New Year. we’ll definitely be eating this on new years day. i was looking for something special and i even have all the ingredients on hand. what luck!! Awww, yaaay! Hopping John (well, black eye peas and greens mostly) is a staple in my family as my people are Gullah (from coastal South Carolina). Sorry for that omission. I corrected the recipe. The bacon should be added at step 6. Yumm…I made this today and it was terrific! Thanks for the recipe, it will be a staple from now on in our family. This was the first time that I have truely enjoyed collard greens. Alas, we didn’t make it. We just ate popcorn (homemade), fudge (also homemade) and grass-fed beef stew. Looks delicious! I had placed an order with my local farmer for pork fate to render. After reading another post somewhere else here, I realized I know that they do not use hormones or antibiotics, but I’ve never asked if they use GMO feed. Well, today I asked and THEY DO! I am officially looking for another source for meat and eggs. I genuinely like these people, and feel somewhat of a tratior.